UU actors performing in 'Eye Of the Storm'. 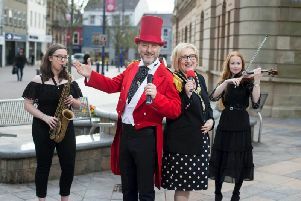 Derry will host free showings of two new children’s theatre productions this evening and again later this month. Ulster University’s School of Creative Arts & Technologies is staging ‘Eye of the Storm’ by one of Britain’s leading playwrights for young people, the award-winning Charles Way. Alongside this, they’ll also be presenting a specially devised piece for pre-school children under the age of five, entitled ‘Oh Ting!’. Eye Of The Storm is an adaptation of the story of Shakespeare’s ‘The Tempest’. Final-year drama student director Laura Young promises: “This is a unique form of storytelling performance, retaining Shakespeare’s story, but adapted specifically for secondary age children. ‘Oh Ting!’ meanwhile is a specially devised production involving drama and dance students. Free performances are being staged in local schools and nurseries, with open performances at the Foyle Arts Building, Ulster University’s Magee campus, Lawrence Hill, this evening (May 8) at 7pm and again on May 21st at 7pm. For free tickets contact TYA_ulster@outlook.com or telephone 07803413355.